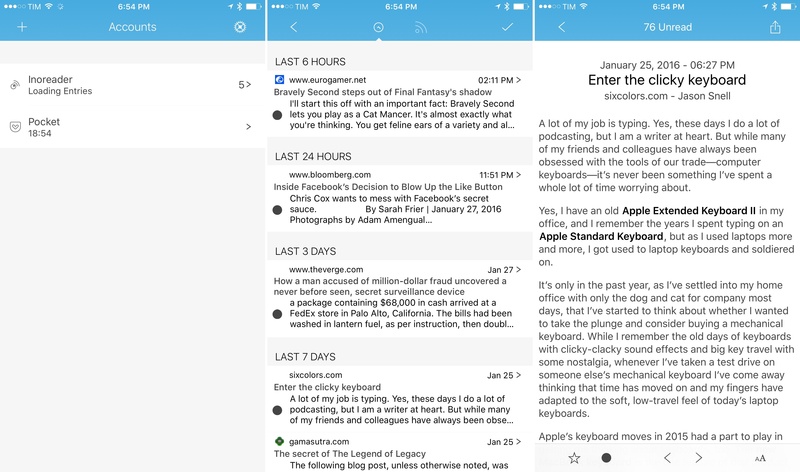 I've talked about Fiery Feeds in my review of 2Do and in previous emails to Club MacStories members – it's an RSS reader developed by Lukas Burgstaller that works with a lot of RSS services and that strives to become the most powerful option for RSS power users on iOS. I'd like to quickly point out the 1.6 update that was released this week as it inches closer to that vision with new integrations. In the new version, Fiery Feeds can sync with Pocket, Instapaper, and Readability, building a unified reading experience that combines RSS feeds and your read-later queue. This isn't the first time an RSS app has attempted such consolidation – notably, both Reeder and ReadKit explored it before – but Fiery Feeds brings its existing set of advanced functionalities to the table, making it a unique offering for those who deal with copious reading material every day. For instance, Fiery Feeds lets you create your own URL actions for sharing links with other apps. I know, they're based on URL schemes and the technology has largely been supplanted by native extensions these days, but if you're looking to automate any sharing activity from RSS (and if you're subscribed to hundreds of feeds, you'll likely want to save some time here and there), URL schemes are still faster and more customizable than extensions. I have an action that sends an article I'm reading to 2Do, attaching a browse action to it so I can quickly reopen it in Safari from my task manager. You can play around with other URL schemes and let Fiery Feeds communicate with your favorite apps, and you can also create custom mail sharing templates to have more control over how an article is shared via email. Good stuff. As an RSS reader, Fiery Feeds is fast (and I use it with Inoreader, which is much faster than any other RSS service I've tried before) and it opens links in Safari View Controller, which means you'll get access to the sharing and Reader features that make Safari great on iOS. I also like that I can disable full-screen while scrolling articles, so the title bar (with the sharing icon) doesn't disappear when I'm reading. If you haven't considered or looked at Fiery Feeds in a while, I'd recommend taking it for a spin. You can even configure it with a self-hosted installation of Tiny Tiny RSS if you're brave enough. Fiery Feeds is Universal and $3.99 on the App Store.